Josanne Cassar | The Malta Philharmonic Orchestra plays exclusively for Banif! You are here: Home » Events » The Malta Philharmonic Orchestra plays exclusively for Banif! The Malta Philharmonic Orchestra plays exclusively for Banif! 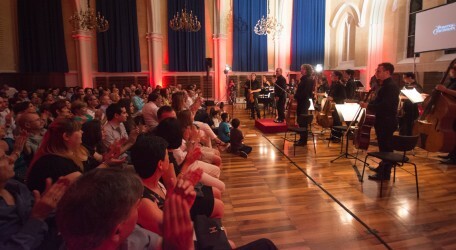 The Malta Philharmonic Orchestra took Banif Bank employees, families and friends on a magical musical journey, regaling an eager audience with tunes from popular film soundtracks, greatly loved by both children and adults. Organised by the Banif Sports and Social Committee exclusively for the Bank, the evening started off with refreshments at the Argotti Gardens, giving staff the chance to chat informally and mingle. Robert Sammut Hall, a former Methodist church, proved to be the perfect setting for the concert, with excellent acoustics to boot. The talented musicians and soloists, under the direction of Michael Laus, treated Banif to an exciting programme of classical music, while Dorothy Bezzina’s exquisite voice well impressed the little ones seated comfortably at the front. The instrumental ensemble performed piece after piece with precision and passion, transforming the evening into a true midsummer’s night dream. The performance was accompanied by visuals from the movies, projected on big screen. The Banif Sports and Social Committee also put together a spin off event, where children created musical instruments from recycled material.